Yes I have a scar – A physical scar. which was once all aglow. though these have elapsed but the scar remains. of others’ sacrifices and of HIS omnipresence. Giving same strength as other vital organs do. Reminder of the gift which I got from THEE . hidden in the stern countenance it wore. anything can happen with anyone , anytime. He has given me one more chance to make my life sublime. has now become my survival tale. Scars can be a mark of survival too. They can be something to look and remember the struggle and how you overcame it. Scars make us unique. I have way too many of them and it is a part of me. I think scars can show what you’ve overcome. I have one on my hand, but it’s from my cat. I guess I could say I survived a cat attack. I think scars are a mark of survival they show what you have overcome and for that reason are something we should never be worried about showing. God, if I told u the amount of bones I have broken!!! I’ve a fair number of scars too. To me they are stories and reminders of how one survived! I call mine ‘battle scars’ and a proof of my survival. Thank you for sharing your thoughts and experience. Stay strong. Scars can be motivators depending on how they were received. I know someone who calls her battle scars her darkest part of her life, but she is encouraged to move on away from those instances because of them. Others judge her by them though, and they always probably will. This is so beautiful! Scars do make us unique! I know we all have that one scar that we would not forget. Maybe one or two. But for sure it has made us more stronger because of this. This is a great poem with a great message. Thank you for sharing the struggle. A scar can definitely be a tale of survival. Thanks for sharing this. Such a beautiful poem! Each scar has its own story, and how you were able to survive hardship shines through. I have also scars on my soul but I take them as sign of my struggle… Thanks for sharing. I also have a scar. As much as I’d love to say that it makes me unique, I really can’t wait to actually remove it. But at least, it’s an experience worth thanking God for. Each scar has a story to tell. Love how you have penned your feelings. 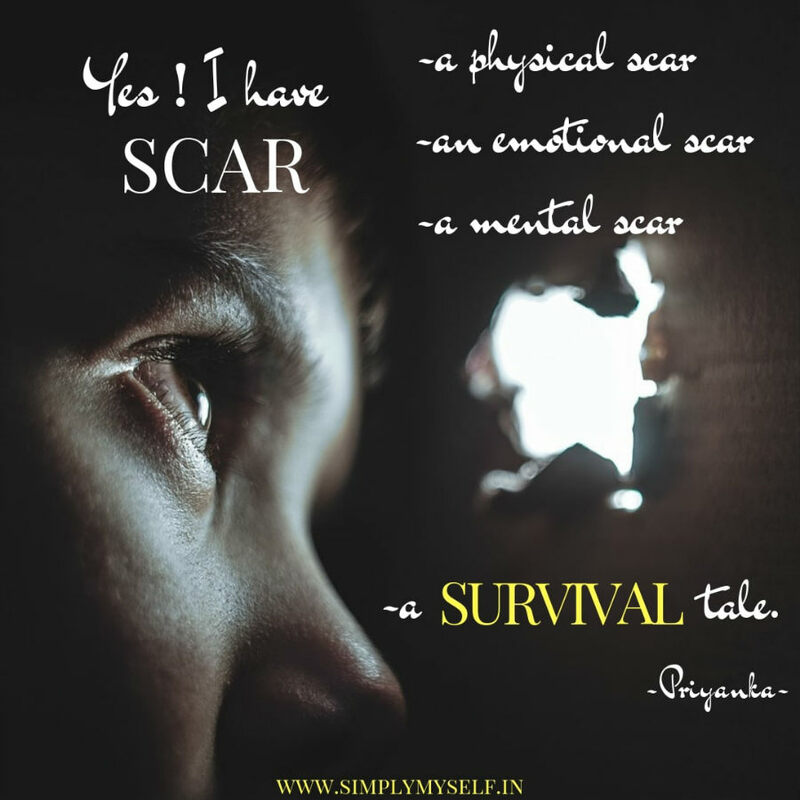 Scars are beautiful sometimes.Scars make us unique.This is a nice poem which I enjoyed reading.